Kitsault is a modern ghost town, one that was abandoned some 30 years ago by over 1,200 mine workers and their families. But the British Columbia town still stands just as its inhabitants left it — leaving an Indo-Canadian businessman with an intriguing idea: Why not bring it back to life? Krishnan Suthanthiran, who made his fortune selling medical supplies throughout North America, wants to make the town of Kitsault into a major hub in the province's growing liquid natural gas infrastructure. 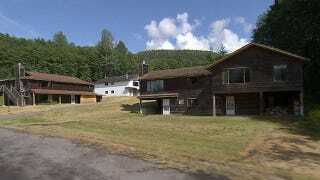 To that end, he purchased the town in 2004 for $5 million in cash. At the time, he was hoping to turn it into a resort destination. Back in the early 1980s, U.S. mining conglomorate Phelps Dodge built about 100 detached homes, apartment buildings, and all the amenities required to support a community — including a recreation center, a curling rink, a movie theatre, a fully equipped hospital, a shopping mall, and a swimming pool. For a time, it was home to some 1,200 individuals. The hospital. It still contains beds — and even saline solution i.v. bags. Image via. But just 18 months later, in 1983, the commodities market crashed and the mine was closed. Phelps Dodge bought back the houses from the workers and ordered everyone to leave. The infrastructure has been built and is ready to go — including access to electricity. Image via.